Here in the South where I am the term Mestizo is also used. 1. The person should have aboriginal or American Indian ancestory, mixed with that of another Race of people. There are no blood quantum rules. 2. The person should identify as a Metis,by proclaiming to be or holding out to the public as a Metis person. 3. The person should be accepted or recognized by a Metis Community. Metis is not determined by blood quantum levels. It would be foolish to think that since the Mating of Aborinal or American Indians began in the 15th Century, either by consent or force. Once you start to trace your family tree and see how many Great Ancestors you have, you will see my meaning. If you read my Nanticoke History Page you will see that the Dutch early on began mixing with the Nanticoke and Other Tribes. Look at the pictures in the Nanticoke Home Page picture section and see the diversity. Please note that Metis is a French word and Mestizo is Spanish word both have the same meaning. After reading and exciting book, titled "Mixed Blood Messages" by Louis Owens I have a better insight about what it is to Have "Shared Blood" or Mixed Blood. If you start to trace your family tree and it runs in to a dead end at the turn of the century, chances are you have a mix of shared abororiginal or shared Indian blood. This is nothing to be ashamed of. You have the best of both worlds. 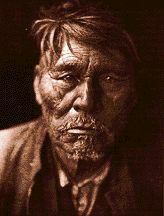 If you read Aboriginal or American Indian history, you will find captives during wars were some times absorbed into that tribe. That is not to mention inter-tribal marriages. Some times that were pre arranged. I laugh when people tell me they are full blooded what ever Nation. I look at them and go "yea Right" To find some one who is a full blood is very rare. One thing that irritates me is one Nation of Indians pointing there finger at another nation and telling them "You're not Indians" which has happened here where I am on a few occassions. They have battled in the court to keep another Tribe from gainning State or Federal recognition. That is so they won't have to share the bennifit's money from the State or Federal Government. Some so called Indian Nations have become nothing more than social "Cliques" it depends who is in office as to whether they regognize you as an Indian. Always remember that they can refuse you in a tribe, but they can not erase the fact that you are a desendant of there Nation. They can not take a pencil and erase you out. The important thing is that YOU know who you are. BIA and Tribal ID cards are just another way for the Government to keep track of you. In my ancestory I have 3 seperate and distinct nations just on my fathers side. Which includes my Grand Mother who was a Nanticoke descendat. Now I have found a possible link to one of the Iroquios Nation's on my mothers side. At the turn of century there was a lot of racicicm and people hid the fact they were of Indian blood.The United States Government offered Indian people citizenship instead of Reservation land. Many people accepted this,including my Great Grandfather on my fathers side,who was Wyandotte. This is somthing your ancestors may have done. They thought it was the best choise at that time. But you did not do it and should not be held accountable for it. Are you begining to see what I mean. To find out more about the Metis people follow the links below.